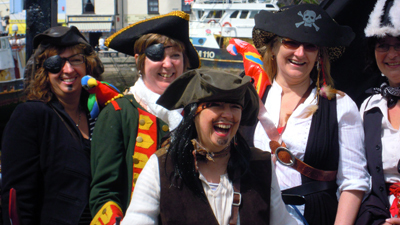 Welcome to Pirate Attack – your one stop port-of-call for pirate-themed entertainment, resources and information from England’s West Country. Looking for a bit of live pirate-style entertainment? Well, me hearties, you’re in luck. Feast your eyes on these regularly updated listings for the latest pirate themed events and festivals happening in the UK and across the seven seas. Ooh arrh! Pirate celebration with procession, music and entertainment. Worldwide celebration of Pirate Speak! Is your child about to celebrate their 5th, 6th or 7th birthday? Why not treat them and up to 20 of their friends to their own pirate party? 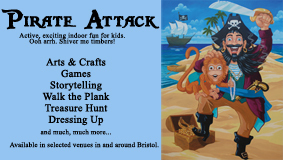 Check out the Pirate Attack Experience, now available for private hire. If you’d like to add a generous dose of swashbuckling swagger, games and activities to your next meeting, why not book Pirate Attack? Check out the details by clicking here. If you’ve always adored pirates, then you should clean the way they do! Despite the belief that pirates are tough people who may not give a damn about cleaning, they actually need to clean their ship, just as you need to keep your driveway clean. You clean your driveway which can easily be seen in your property, while pirates maintain something that can’t be easily seen in their ship–the bottom part. This cleaning activity is what they call “careening.” And just like maintaining your driveway, it also involves a lot of work. And I mean A LOT. First, they find a harbor where they’re safe from authorities, after all, being a pirate is illegal. Their safety is a priority. Not only that, the place should offer fresh water and sources of food too. Usually, they select a beach with a long and gentle slope for this task. Second, their ship needs to be lightened. That means transferring everything from the boat to the land. They accomplish this task by placing every object into the longboat and rowing that boat to shore. They’ll keep repeating this transfer until the ship’s free of barrels, crates, and everything else pirates have on their ships. Next, they’ll tie strong ropes to the ship to enable them to drag the entire boat to dry land, then they’ll tilt the ship over to its side. Finally, they can start cleaning the bottom of the ship. Why do they go through all this trouble to clean the bottom of the ship? The answer is the same with why you have to clean your driveway regularly. Although the bottom part can’t be seen by anyone else aside from the pirates, it’s essential for them to remove the seaweed, barnacles, and other marine growths. Keeping the bottom smooth is what they want because if it isn’t, it could drag hundreds of shells and immeasurable yards of tailing weed. Aside from those being gross, they would also jeopardize the speed of the ship. If you’re a pirate fan, you’ll know that pirates rely on pace to catch their preys and escape from Navy ships. The same thing goes with your untrimmed driveway. If you let grass and weeds to grow, they’ll attract unwanted living creatures and more dirt. Admit it or not, it’s not often that you get the chance to spend more time with your loved ones and take a breather at the same time from your usual and hectic work schedule. It’s either one or the other and regardless of what you’ll choose, you will still end up thinking a bit cheated on due to time constraints. Admit it or not as well, it’s not often that you get the chance to spend more effort for your own self and make a changer at the same time from your usual and frantic home schedule. It’s either one or the other and regardless of what you’ll choose, you will still end up feeling a bit cheated on due to effort restraints. You see and especially during the summer months, you can always choose one from the said options above and still get to see for yourself how it’s like to do the other in your own pace. But that’s because swimming like a pirate is like taking a risk, not knowing where you’ll end up – only knowing that it will all be worth it in the end. And it will be, right? Especially if your loved ones are involved. But the best part? All you need to do is relax your body under the warm sun within a beach-like ambience and dip your feet into those soothing ripples in the water. You also see and even during the winter months, you can always choose one from the said options above and still get to experience for yourself how it’s like to do the other in your own way. And that’s because swimming like a pirate is like making a risk, not knowing how you’ll end up – only knowing that it will all be worth it in the end. And it will be, right? Even if your own self is involved. And the best part? All you need to do is rejuvenate your mind over the cool air within a mountain-like atmosphere and dip your feet into those calming waves on the water. What do you think about the fun in swimming like a pirate? What do you feel about the fun in swimming like a pirate? If you love Disney’s Pirates of the Caribbean, where the awesome Captain Jack Sparrow is awesomely portrayed by Johnny Depp, then you have come at the right place. And that’s because as of this moment, we’re not going to talk about anything other than why saws are like pirates – especially if you’re using one of the top miter saw stand picks right now. You see and just like saws, pirates are sharp when it comes to finding what they’re looking for. Be it a long-lost and obscured artifact on an island that can only be found in one of the world’s largest oceans or a near-lost and exposed artifact that can just be found in a temple on one of the world’s tallest mountains, pirates will definitely be there to fight for what they want and that is to find what they’re looking for – and yes, just like how a saw truly works despite the fact that it’s usually taken for granted as some people only get to see it as something that can be used for when one needs to cut something down; and yes again, whenever one lets his creative juice flow like no other and use just about every bit of creation in heart to create something new from scratch. That’s because indeed, saws and pirates are both sharp when it comes to a lot of things – including what they’re truly made of. You also see and just like saws, pirates are shaved when it comes to figuring what they’re dreaming of. Be it a long-lost but exposed on an island that can only be found in one of world’s deepest oceans or a near-lost but obscured artifact that can just be found in a temple on one of the world’s widest mountains, pirates will definitely be there to fight for what they need and that is to figure what they’re dreaming of – and yes, just like how a saw really works despite the fact that it’s usually taken for granted as other people just get to experience it as something that can be used for when one needs to trim something up; and yes again, whenever one lets his innovative juice flow like never before and use just every bit of innovation in mind to innovate something old from scratch. And that’s because indeed, saws and pirates are both shaved when it comes to a lot of things – including what they’re truly meant to. What do you think about saws? What do you think about pirates? Do you know any other reasons why saws are like pirates? A keen interest in pirates and things pirate-related often sparks curiosity and raise a lot of questions. It makes you wonder if the ones that occasionally get featured on the news for committing crimes at sea are similar to the fictional buccaneers that tend to get romanticized and sometimes even idealized. And at some point, you may even start thinking just how safe the oceans and seas really are from them, especially when you hear disturbing stories of their attacks on hapless seafarers. Traveling across the seas on a ship provides a different and unique experience. The fear of falling prey to pirates is understandable. But it should not be enough reason to stop anyone from taking a cruise and see the views from the oceans. Many who have taken a cruise to different parts of the world have positive things to say about their trips. So if you are thinking of giving cruising a go, it is never too late to get started. Places like the Galapagos Islands and all its natural wonders beckon. The weather in Galapagos in June is fairly pleasant for a trip to see some of this famous tourist site’s attractions. It is a great time to see some of the migratory birds and aquatic species that head to the islands. The cooler temperature is an added bonus making the days out soaking the sun and scenery more pleasant. June has always been a popular month for tourists to visit so expect that things may not be as quiet as the off-peak season. If you are thinking of taking a cruise in Galapagos, make sure to book your trip early if you want to get a spot. Do you ever have a dream of becoming a pirate? Me too! Who doesn’t love to be one? Sailing with the waves, drinking lots of booze, and laughing with other pirates. What an amazing experience to have. What if I told you that this is possible? Well, it is! Join the London Pirate Festival and let’s celebrate together. So, to understand why you should join us, let’s proceed below! Argh. Matey. You want me to wipe that grin off your face? Show off the best pirate garb you have! The spotlight is all yours. To make it more real, talk like a real pirate! Interact with other pirates and experience the best pirate festival of your life. You can even win a prize for the best pirate costume. There’s nothing stopping you, not in the London Pirate Festival! Ever heard of the game Metal Gear Solid 4? Have you noticed that the main character has an eyepatch? Is he a pirate or not? Well, to find out what he is, visit metal gear solid 4 ending explained for the surprising answer! Feast like a pirate. What’s the best thing to do after some hours of communicating and having fun with co-pirates? Of course, eating! You’ll find tasty foods, snacks, and more in this one of a kind festival. Be wild and let your inner pirate show. No, you’re not imagining things! You can join us and hunt treasures together. Explore and roam around the five decks and even the captain’s cabin. Feel free to treasure hunt alone or with families to make hunting exciting. There’s more you can expect. Find it out yourself by joining us in our wonderful journey! A once in a lifetime opportunity you won’t regret experiencing! Join us and let’s party and treasure hunt like a true pirate. Thank you for reading. Share your thoughts below and I’ll see you next time.